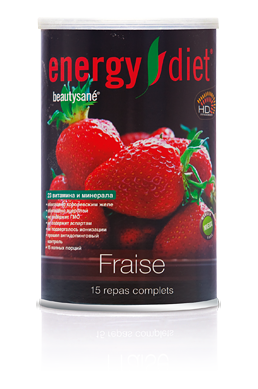 The Strawberry Energy Diet has the sweet taste of ripe summer berries. Mixed with cool milk, this shake always runs out too fast. Soy proteins, dextrose, milk proteins, identical to natural flavors, vegetable oil (soybean oil, dextrose syrup, caseinate, natural flavor), pea proteins, potassium citrate, starch, calcium ortho-phosphate, chicory inulin, granulated strawberry (strawberry, maltodextrin), thickening agents (cellulose gum, tare gum), red beet, magnesium carbonate, sweetener (acesulfame-K), vitamins (PP, C, E, A, B5, D3, B6, B1, B2, B9, biotin, B12), acidity regulator (citric acid), salt, Acerola Malpighia glabra L. (149 mg / 100 g), iron sulfate, zinc citrate, royal jelly (31 mg / 100 g), manganese gluconate, copper gluconate, enzyme complex, potassium iodide, sodium selenite.